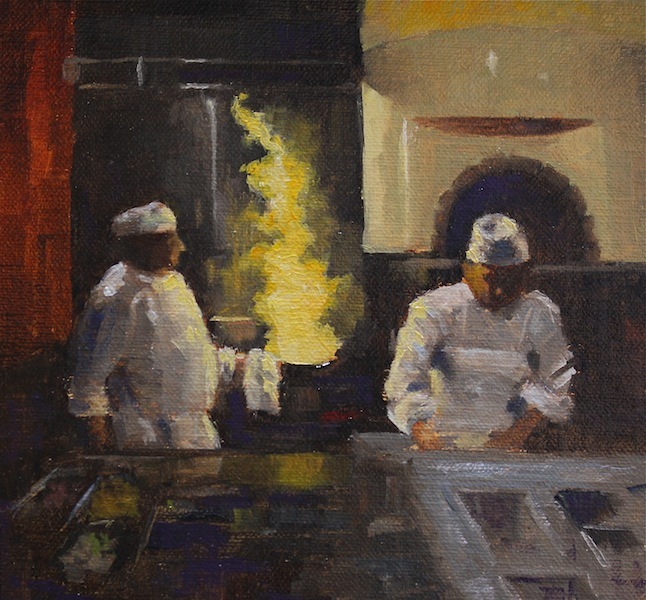 A very "painterly" painting of the Open Kitchen area of the Macaroni Grill. The Restaurant manager was very nice and let me take many pictures while the cooks were in action. (It goes without saying, the food was delicious, as usual). 6x6 inches, oil on linen. Fabulous! This is Faisal at his best! Forgot to ask - has the manager seen this yet? He'll love it. Thanks Jan. The restaurant is far away from home, so I doubt if I will go back there any time soon. Very painterly as you mentioned. I could see where the restaurant might express an interest in it. PS I deleted the other post to avoid confusion. I love the oven and the lighting in this. The reflections in the left foreground are great. And all this in a 6 x 6!